As for the wines, we reached 22 brix in the majority of our fermenters resulting in alcohol levels of approximately 12.3 %. Staying true to our philosophy of producing vintage driven Pinot Noirs, no chaptalization, concentrating or reverse osmosis was performed in the winery. The Estate Reserve consists of four select barrels, two of which were chosen from whole cluster fermenters. We were able to use the whole cluster process due to the generous hang time provided by this vintage. Stem lignation was complete and most of the seeds had hardened off and turned brown. The Estate Reserve was aged in wood for 16 months, 50% of which was new French oak. Three clones contribute to the blend, 50 % of the juice coming from our 115 Dijon fruit, and 25% each from our new Pommard and Wadensville blocks. While not identical, the wines from 2011display characteristics similar to those found in the 2007 vintage. The Reserve, along with the Estate wines, will take more time for the fruit component to emerge. Two years now in bottle, a greater balance is being struck between the natural acidity of this vintage, ph ranging from 3.42 to 3.50, and the sweetness of the grapes. While the story of the 2011 vintage continues to evolve, the flavors on the palate combine the fruit of raspberry, strawberry and red cherry and the aromas reveal cinnamon, clove, rose and the earth from which it came. It goes without saying; this wine is designed for fine food. Enjoy! 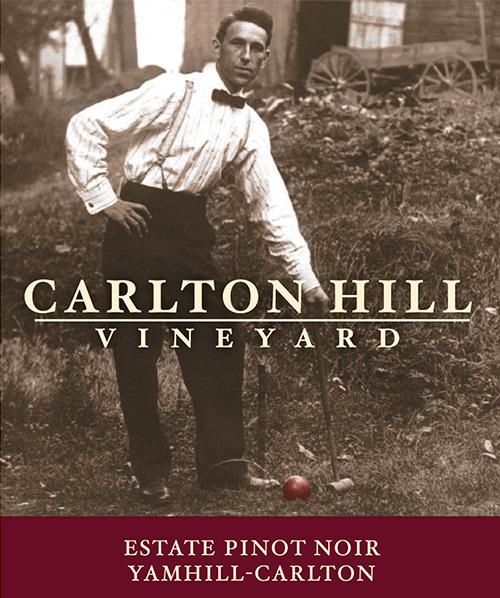 Carlton Hill Vineyard is the exclusive source of grapes for all Carlton Hill Pinot Noirs. Located in the center of the Yamhill-Carlton American Viticulture Area and due west of the Dundee Hills AVA, the vineyard sits at an elevation ranging between 420 and 480 feet and is comprised of Willakenzie and Peavine soils. Most notable about Carlton Hill Vineyard is that it enjoys a pure eastern exposure to the sun, not unlike the great Gran Cru vineyards of Burgundy, but in contrast to most Oregon vineyards which face south. We believe the eastern orientation of our vineyard allows the grapes to ripen in the most gentle manner possible, preserving the delicate-yet-complex nature of the Pinot Noir grape. Just when you think it is safe to go outside again, Mother Nature has other things in store. As hard as this is to believe, 2011 made our work during the 2010 vintage look like a walk in the park. Not only did we have to deal with angry birds again, but we somehow had to ripen a crop without the benefit of summer. 2011 turned out to be the coldest year on record here in Oregon. Bloom, something we can usually count on in early June, was not complete until the second week of July. I was heard to say on several occasions, to anyone who would listen, that 2011 would not be providing us a crop. Thankfully, I was wrong. In the end, it was all about good farming and canopy management. To get to proper ripeness, as much as 40% of the fruit was dropped on the ground due, in part, to an unusually large fruit set. Again, just one of the hurdles thrown up by this vintage. Thankfully, with a late season rally in the weather and, a lot of patience, we picked our first grapes on October 24th . Our older blocks were picked just two days before we went trick or treating. Vineyard faces east, like its cousins in Burgundy.